Welcome to www.TGIFunky.com: TGIFunky! returns on Friday the 13th! TGIFunky! returns to the APK for another night of funky beats and breaks! 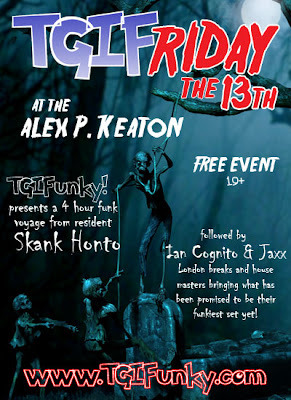 resident Skank Honto (http://www.skankhonto.com) takes you on a 4 hour funk voyage bringing a wide spectrum of funky beats of all tempos, eras, and sounds, working into the groove from 9pm. to finish you off, London's breaks and house masters Ian Cognito & Jaxx will be stepping up with what promises to be their funkiest set yet! this may be a spooky date, but the scariest part would be missing it! and its all FREE FREE FREE!! !